People talk about Moana for the incredible music of Lin-Manuel Miranda and they should! The songs are catchy, fun, and inspiring. People talk about Moana for the heart-warming story, the funny characters like Pua and Hei Hei and the Kakamora. And rightly so. Pua is about as cute as can be and Hei Hei is a laugh riot! And people talk about Moana for the singing and acting of its two principle stars – Dwayne “The Rock” Johnson and newcomer Auli’i Cravalho because they are impressive. But a big part of the Disney magic lies in the months and years of work that go into a film before the rest of it becomes a reality. The Art of Moana captures the essence of that hard work. The Art of Moana collects these stories and influences into one central place. While you do see plenty of pre-production artwork and are told the story of the evolution of both the characters and the setting, the heart of this book is about the depth and love for the people and culture of the Pacific Islands. So much rich detail was put into every aspect of the film to honor the traditions and history of the Oceanic people and you can see that in the pages of this book. For example, Bill Schwab, art director of characters said, “[Executive Producer] John Lasseter pressed us early on to sweat the details in costuming (p.42).” Details like the difference in color usage between the voyagers and the villagers. Neysa Bove, costume designer and visual development artist for the film said, “The voyagers…brought in a lot of color from the vegetation around them…the Motonui villagers lose their color. The plants they use are dried, and when things dry they become brown.” Those are the kind of details the film’s creators put in to Moana and are captured by the authors. MOANA – (L-R) Jessica Julius (Senior Creative Executive), Ian Gooding (Production Designer), Andy Harkness (Art Director, Environment & Color) and Adolph Lusinsky (Director of Cinematography, Lighting) present at the Moana Long Lead Press Day on July 27, 2016 at Walt Disney Animation Studios – Tujunga Campus in North Hollywood, CA. Photo by Alex Kang. © 2016 Disney. All Rights Reserved. MOANA – (L-R) Bill Schwab (Art Director, Characters) and Neysa Bové (Visual Development Artist) present at the Moana Long Lead Press Day on July 27, 2016 at Walt Disney Animation Studios – Tujunga Campus in North Hollywood, CA. Photo by Alex Kang. © 2016 Disney. All Rights Reserved. If you love Moana and want to know even more about the background and history of the characters, this is the perfect gift for you. Or if you’re curious about the dedication to authenticity and detail that Disney puts into their animated films, you’ll love this book, too. The Art of Moana doesn’t focus as much on “what could have been” or “lost storylines.” Instead it delves even deeper into the movie and peels back the layers of what you see on screen. 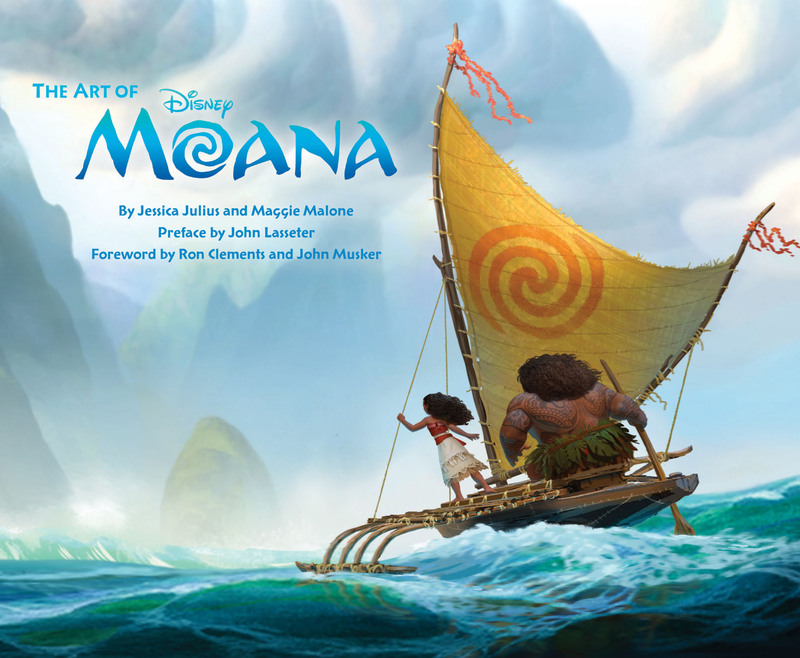 The Art of Moana is available now in bookstores and online at Amazon. Curious about the soundtrack? Read about it all in our review of the deluxe soundtrack.